So Underlord is a new Hero on Dota 2 and you need to find out a bit more about his skill sets and what some advantages and disadvantages are. I will only be covering his abilities here but I may include a more comprehensive guide in the near future. So looking at firestorm. You shoot down 6 waves of green fire from the sky in an awe. And then it does a nuke every time with 70 damage. Which is very little but there is 6 of them so it does about 420 magic damage. And if you walk through the fire and get hit by any of these then you get a burn for 2 seconds which does up to 3% of you max HP. So this skill does maximum 420 magic damage and it does up to about 21% of you max HP in terms of magic damage as well. This is a very high nuke and good against Heroes even scaling in the late game. In the early game though it is also very good as farming. Is a pretty strong disabling skill. It is a very long cool-down at level one with 21 seconds. But the nice part about the 1 skill point is that it does 100 magic damage. Very strong level 1 nuke. 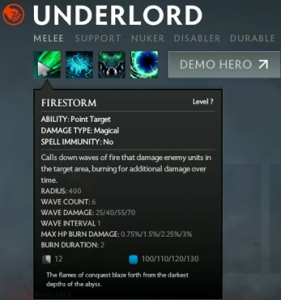 This skill gets very good in the late game because you will have a 12 second cool-down which is the same cool-down as firestorm. 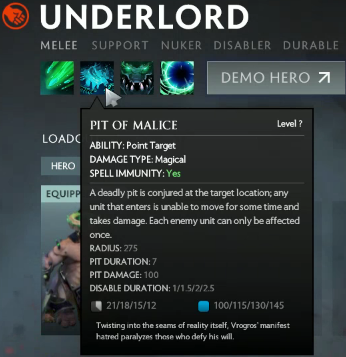 So therefor every time you cast firestorm you should also cast pit of malice. And it immobilizes hero’s from moving which means they are going to stay in the firestorm for longer. The other really cool part about this skill is that as it’s up it stays up for 7 seconds so even if something hasn’t been disabled from your initial cast, if they walk into that awe or blink into the awe or whatever in the next 7 seconds they will be then disabled for the next 2.5 seconds. So while you keep it up during team fights, it will be very strong. It also has some other really good benefits, mainly the fact the it works against BKB. If you Pit of Malice and they pop BKB they will remove it but if it is already on it will last on you for 2.5 seconds, so it is very good against malee heroes. So this is a very strong skill, espcially against Malee heroes an heroes that uses BKB. What this does is a 900 radius aura, and it reduces damage of enemy heroes and creeps. Keep in mind that 18% reduction with level 1 is only based on your base damage. 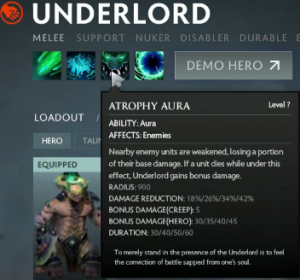 So if heroes buy a lot of things like rapier’s, daedalus or things that give you plus damage then an atrophy aura does not affect them. But if you use it against heroes like morphling, terrorblade, luna or heroes that buy a lot of stack items then those stack base damage increases and atrophy aura actually affects them. And that is why he is better against some heroes then others. The best thing about atrophy aura though is that if enemy creeps or heroes die in your aura you get bonus damage to your Underlord hero. Which means if creeps die it is 5 bonus damage for 30 to 45 seconds depending on how many skill points you have and if it is an enemy hero that dies you get 30 to 45 bonus damage for 30 to 60 seconds. For that reason it is not really worth getting multiple points in Atrophy Aura in the early game because your damage increasing kind of happens based on creeps. But it is mostly about heroes really buffing it up heavily and you can’t really expect heroes to die before you get that damage. That is why I don’t like maxing this skill early but in the early game with one skill point it is still very effective even as a support. 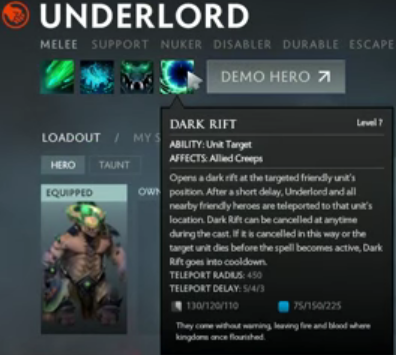 The last skill that Underlord have is called dark rift. And what it does is you cast this on an ally tower, creep or your fountain and after a delay of 5/4/3 seconds it will teleport you and any heroes in a 450 radius to that location. It is really obvious when it is teleporting in but is mostly used as a defensing skill. So if you getting ganked or if you going to die you use it to teleport home. This also allows you to split push and defend against split push and also allows you to save your team mates if they are dying in fight. 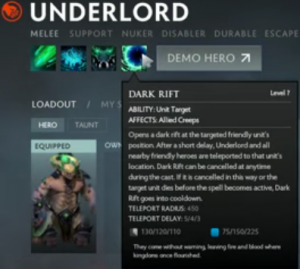 So that is the basics about Underlord’s skills. The more important thing is how you play him in the early game. This entry was posted in Dota 2, Gaming, HendrikWiese, Tech and Gaming Blog. Bookmark the permalink.